Ashiyu, or foot-bath service, is held monthly by our volunteers in five temporary housing sites: the Sports Field No.1 of Shichigahama, the outdoor activities center, and the school yards of Utai, Minatohama and Shichigahama junior high schools. 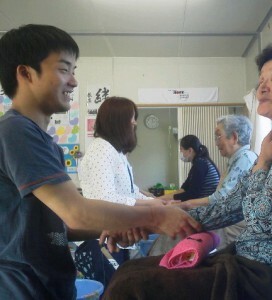 As we have been offering this service ever since we started to work in Shichigahama, it is one of the better known and popular volunteer programs among the residents. About ten students participate in the program each time and the number of students who return is　gradually increasing. Professors I and S are trying to support our activities as well, giving students a ride from the station or providing other voluntary background support to encourage the students’ activities. Now into our third year after the earthquake, we are beginning to pass over our activities to the local people little by little. 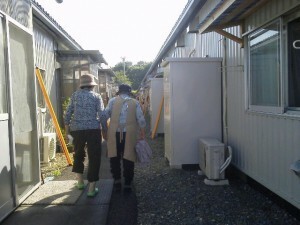 This is a scene from the other day of women walking back to their housing units after receiving our ashiyu service. A lady who lost her husband just after they moved into the temporary housing, and who is suffering from progressing dementia, is tightly clasping the hand of another lady whose vision has deteriorated so much she can hardly recognize the facial outlines of people. People’s lives would not have changed if it had not been for the disaster. No matter how much people wish, they will never get them back as they were. If so, why not support each other with the things we have in this moment? We could almost hear their thoughts as we watched the two ladies walk away hand in hand. Public housing for the disaster-affected people in Shichigahama will become available at the beginning of April next year. At this moment, 222 families have applied to move in and 60 % of them are single-person or elderly person households. A lady who received our ashiyu service told us that she knew everyone in this temporary housing site, so she feels safe here, even if she doesn’t talk to them every day. The biggest concern for her after moving into the new public housing is to lose this relationship. She said when she thinks about it she cannot sleep at night. There are people who are already worrying about things that will happen in their lives a year from now, like this lady. The local government tries to allow people from the same community to live close together as they used to, and to create a warm atmosphere in the public housing through architectural designs resembling the old nagaya, or row houses. Moreover, some workshops were organized by the local government for them to be able to create an environment that reflects the opinions and preferences of the residents as much as possible. The residents know that they should accept the reality they are facing, and they understand that lots of people are being considerate about their situation. Yet, even though it may seem like asking too much, sometimes they cannot help but let out their fears and resentments. And at other times, they wish to forget the reality for just a little while, and laugh heartily and have a good time. Can we call such tiny wishes “luxuries”? We feel the ashiyu service functions as an important place where such emotions of the residents can be accepted. We have been warming the feet of 3,000 residents in the same style with the help of approximately more than 1,500 volunteers. We believe that this has been made possible by the accumulation of time and people which has deepened the residents’ sense of security and trust.